See, I grew up in Liverpool in the 1980s. Hard times in a rough city; it had a dubious reputation for crime and wouldn’t have been high on the list of tourist destinations. Yet at the time we still felt thankful we weren’t Glasgow – a similar city but somehow even worse. But then, in 1990, Glasgow was European City of Culture. We were all very sceptical (indeed even Scottish comedians at the time made jokes about the concept), but a combination of that, plus probably the best tourist board campaign ever seen in the UK (“Glasgow Smiles Better”), has made Glasgow grow from strength to strength, and reclaim its rightful place on the radar of visitors to the UK. My remit from CheapFlights was simple: book a flight & hotel through their website, then explore this oft-forgotten but vibrant city as much as possible, highlighting cheap and free things to do for the budget traveller. Catching an early-morning flight from East Midlands airport with FlyBe saw me arrive at Glasgow Airport around 10am. There’s a myriad of ways to get from the airport to the city centre, but I chose the cheapest option; a local bus into nearby Paisley, then a swift express train (about 15 minutes) into Glasgow. This also gave me the opportunity to explore this small historic town, which itself is campaigning to be UK City of Culture in 2019. 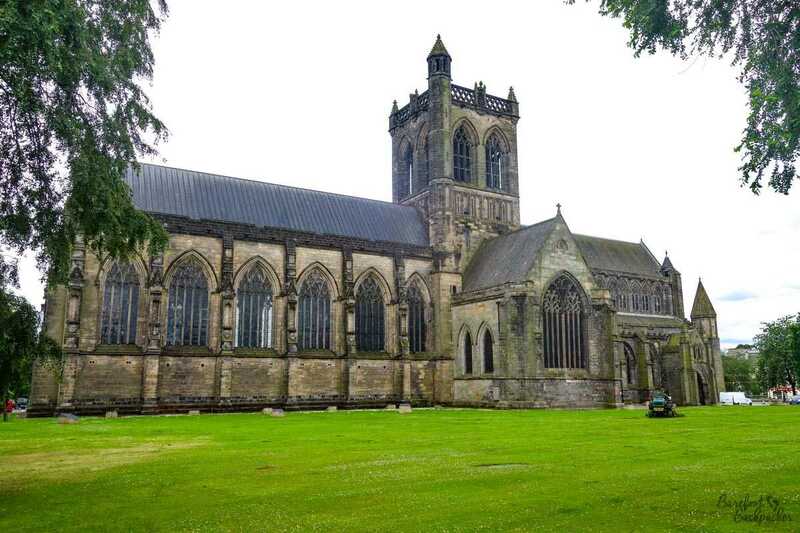 Paisley’s main draw is the old abbey – a church dating in part from the 1100s and which is the final resting place of the early Stewards of Glasgow (from whom the Stuart Monarchs descended) as well as a couple of the first Scottish Kings, thus being an important site in the history of the country. It’s an imposing building (free to enter, donations welcomed – I’m going to write this a lot! ), and still an active part of the local community. The staff were only too eager to point out the flaws in the design and structure, but were genuinely proud of its history and very welcoming. The outside of Paisley Abbey. Between Paisley and Glasgow city centre lies the suburb of Govan – definitely one of those parts of Glasgow with a bit of a bad reputation (a wander down its high street will definitely demonstrate why! ), but it houses a little gem of a church its own. Govan Old Parish Church isn’t open very long each day, and it’s not that big. It stands a little way off the main road, close to the Clyde River, its small graveyard overgrown and unloved, but it too is one of the oldest churches in the area. 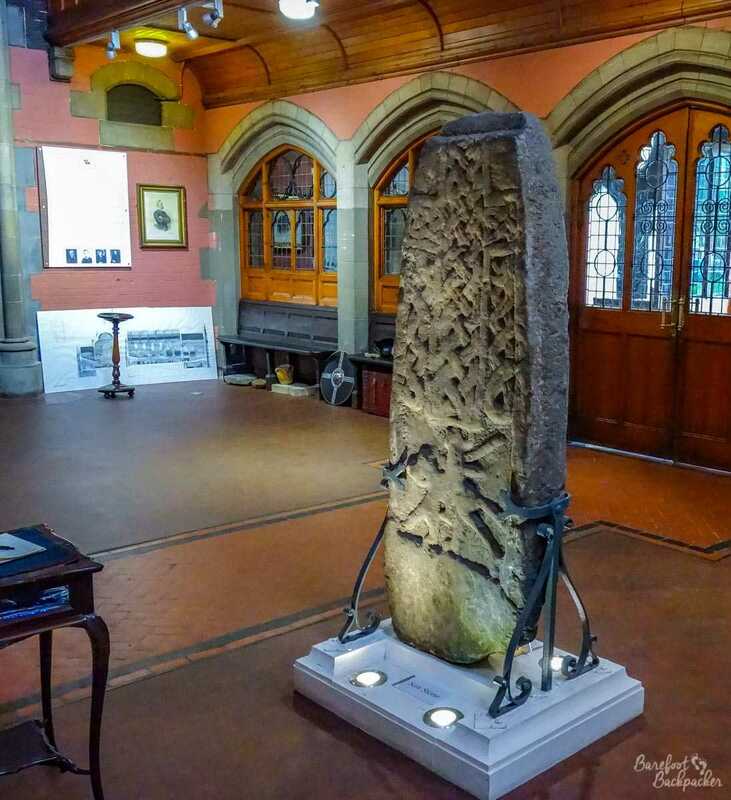 Its main draw are the Govan Old Stones – mysterious menhirs from the late first millennium discovered in the grounds of the church and now kept inside for protection. It’s quite humbling to be face-to-face with something so old in a region that not many people think of when talk turns to ancient history. One of the ‘Govan Stones’ inside the abbey. Getting to Govan is quite easy – not only is it on the subway loop, but the free passenger ferry across the Clyde from Partick has started running again; it only takes a couple of minutes and runs regularly throughout the day. It docks on the North side of the Clyde right next to the Riverside Museum (of which more later) so it’s an easy and convenient side trip. My entry into Glasgow was into Central station, an incredibly imposing building that’s reminiscent of some of the London termini. It lies in a huge stone Victorian building that also houses a hotel (not mine! ), and is merely one of many similar buildings across the city centre. This is probably Glasgow’s most accessible instant attribute – as befits a city built on trade, like Liverpool, the city is full of gloriously imposing Georgian and Victorian architecture. 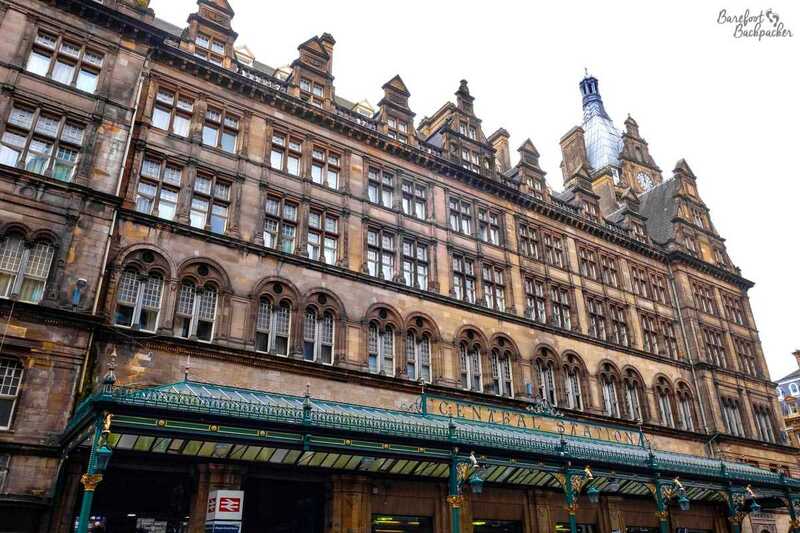 The outside of Glasgow Central railway station. Another fine example of this is just outside the city centre itself, near to Kelvingrove Park. The road called Park Circus is a small circular road surrounding an enclosed gardens, and is very reminiscent of the Royal Crescent in Bath. The fine old houses on Park Circus in Glasgow. Very close to the city centre, yet also very exclusive. In fact the whole area around Kelvingrove Park is full of buildings like this – not just residential but also the nearby campus of Glasgow University is worth a slow wander through if you like tree-lined boulevards lined with impressive stone buildings; a great location to study. One of the stone buildings of Glasgow University. Definitely exudes privilege and authority. 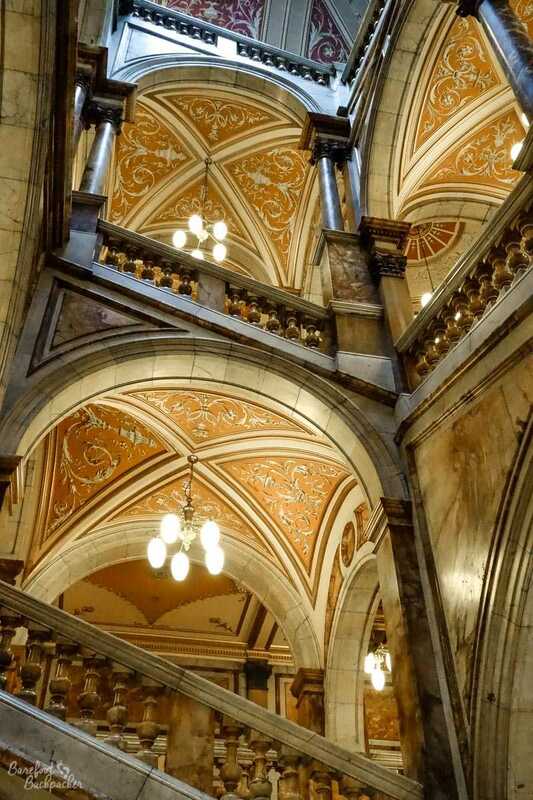 If you want to get a closer look at some of this architecture, the City Chambers – the home of Glasgow City Council – run free guided tours inside twice a day on weekdays. 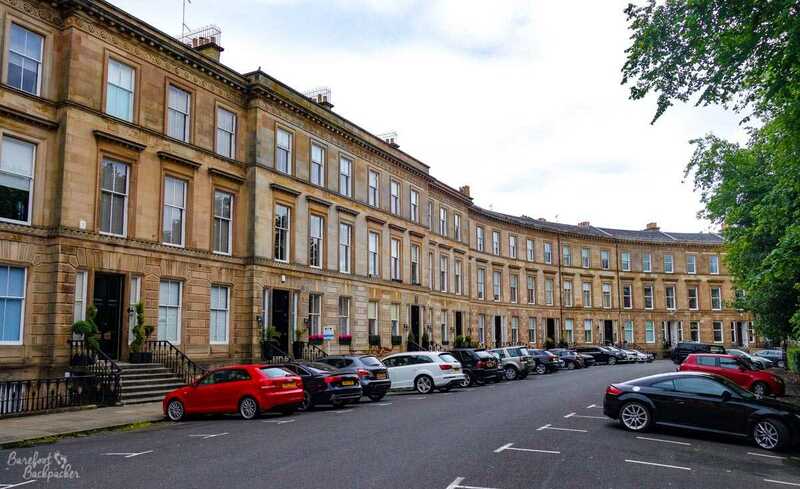 Built in the late 1800s, it’s a perfect example of the Victorian architecture that abounds in central Glasgow. Apart from the opulent and individually-designed large meeting/function rooms, each decorated in different styles of wood panelling (including a mahogany room and a satinwood room – I’d never heard of satinwood either), it hosts what is believed to be the largest marble staircase in the world. The outside of the City Chambers building. The oldest buildings though are to be found on the Eastern edge of the city centre. The grand Gothic cathedral (again, free entry: donations welcomed) dates originally from the middle of the 12th Century – the oldest parts (complete with alleged tomb of the founder, St Mungo) being slightly underneath the current building in what feels like a wholly separate church; I’ve been to quite a few cathedrals across the country and I’ve never come across a unique layout like this before. 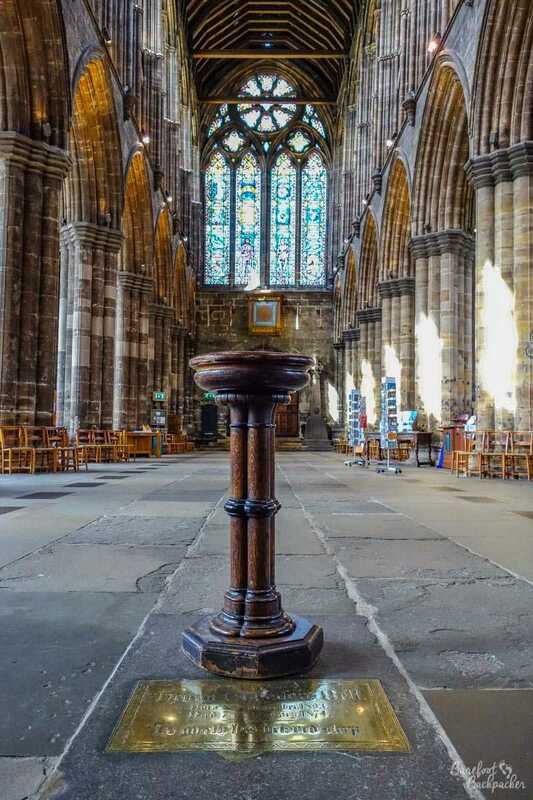 This lower church would be worth a visit on its own (a quite dark, atmospheric, assembly; it feels its age), but it’s merely a small part of the much larger structure – the main part of the cathedral being dominated by a wide nave; its height of 32m means the whole place has an open, airy, light feel. Beyond the choir area the church continues to some small chapel rooms, each dedicated to a different saint. 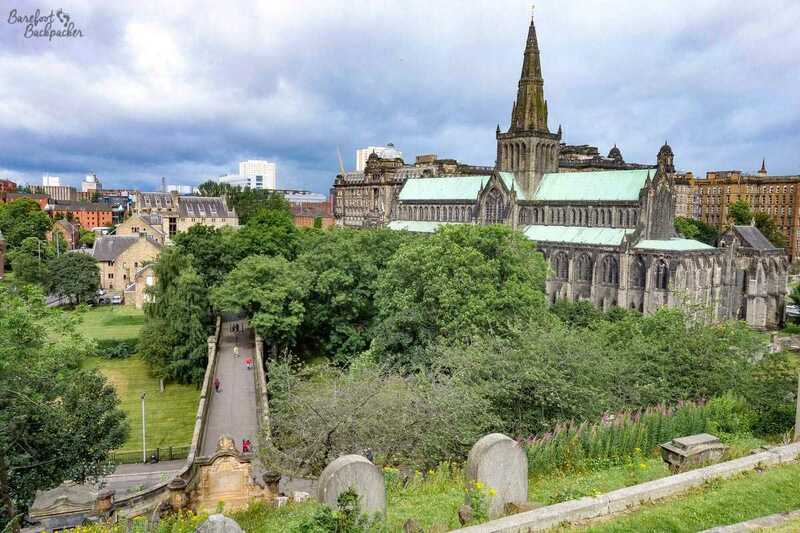 Behind the Cathedral is the Necropolis – a graveyard covering approximately the size of a cricket field but one which feels much larger due to its relatively haphazard structure; typical of cemeteries of its time it’s not designed to any coherent structure, rather the paths through it wander up and down the hill it’s built on. The very top of the hill is marked with a huge statue – a memorial to the Scottish religious icon John Knox – but all the way up the path the graves and mausoleums come at you out of nowhere, with no pattern – plain gravestones stand next to large family plots; the notable lie next to the everyday. Panoramic overview of the highest parts of the Necropolis, with Glasgow City in the background. The road from the Cathedral to the entrance to the necropolis passes over a wonderfully striking bridge, and the vista of both the Cathedral and the city in general get better the higher you climb up the hill. As is typical of graveyards, it feels quiet, even though it’s in the heart of the city, and is a wonderful way to spend a couple of hours wandering in silent contemplation. Or just to admire the views. Glasgow Cathedral, as seen from the Necropolis. The bridge is just visible centre-left. It’s in pretty good nick, in all honesty. 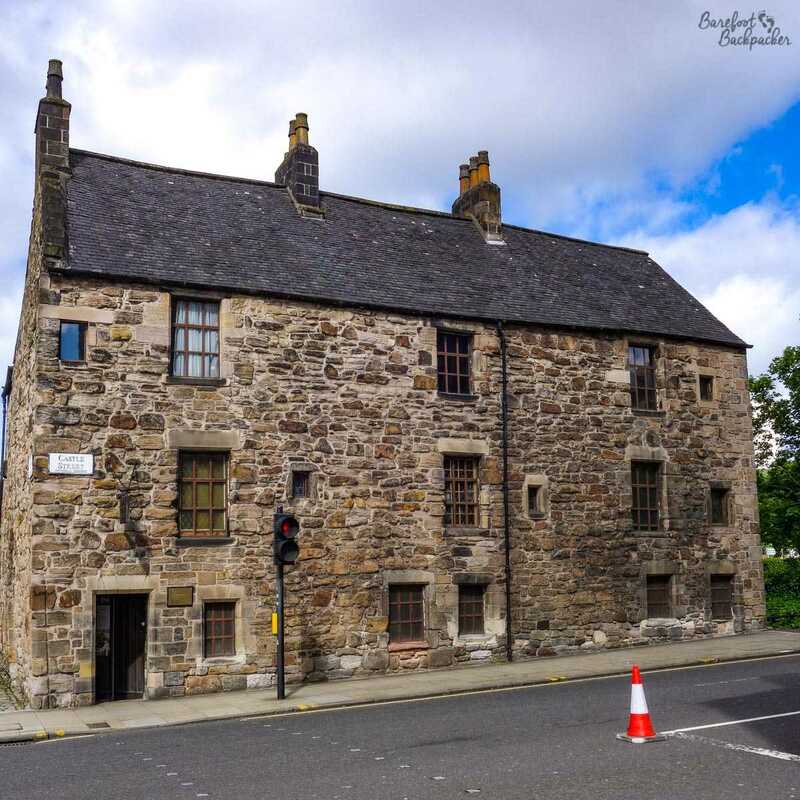 Originally assumed to be the residence of the Canon of Provan (hence its name), and part of the old hospital that served the Cathedral, it’s served as a family home with a shop on the ground floor for much of the last 400 years, being used by, amongst others, a malter, a hangman, as a pub, a hairdressers, and a corner shop, so it’s rarely been left to rot (unlike many other buildings of its time). Each of the floors has been laid out as it would have been when built (as much as they can tell anyway), with period furniture and decorations. The top floor also serves as a small art gallery – on my visit displaying pictures of old Glasgow. St Nicholas garden as seen from the upper levels of the Lordship building. 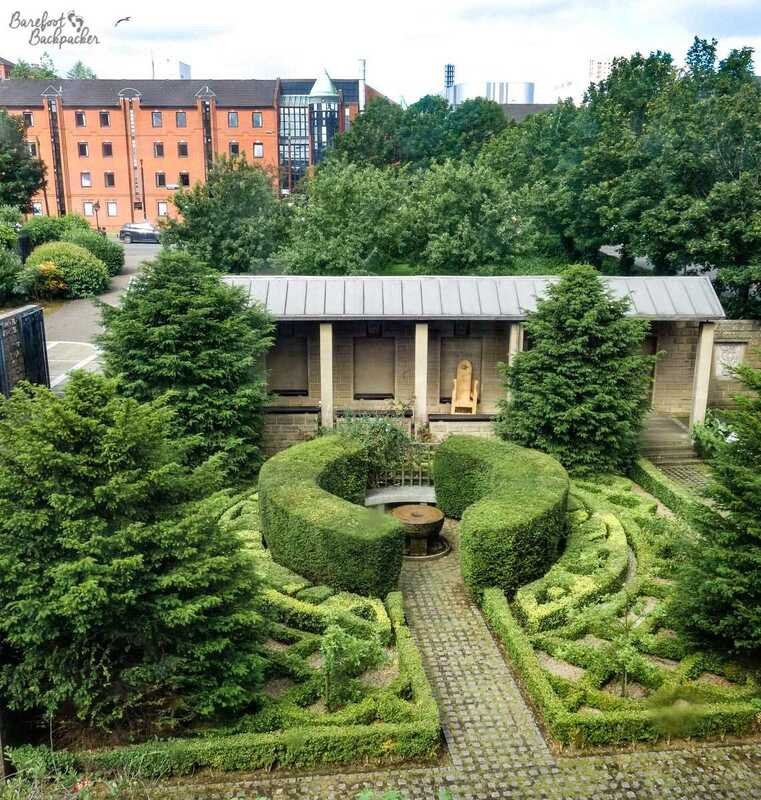 Out the back of the house is St Nicholas’ Garden – representing how it would have been used in the old hospital days, with paths around a variety of medicinal herbs, each bank of which holds herbs used in medicines relating to different parts of the body. Inside the Panopticon Music Hall, with genuine period features in evidence. Used as a glorified store cupboard for many years after closure in the 1930s, it’s been faithfully recreated and indeed still has events like silent movie night, complete with on-site piano player. The walls are lined with posters and adverts from this era, as well as a small display of WW1 memorabilia, and one of the volunteers who runs the place makes his own old-fashioned musical instruments out of boxes and string. Nearby is the Police Museum, hidden away in a couple of rooms above a charity and counselling office. It’s run by a couple of ex-policemen, and goes into detail about the history of policing in Glasgow specifically – from its foundation as the first designated Police force in the UK in 1800 all the way to the creation of Strathclyde Police in the mid 1970s – including the development of the uniforms and equipment, stories of a few of the policemen and women who served, and details of a few of the important cases they dealt with in their history. In a side room they have badges and some uniforms from police forces across the world; from several of the US states to places like Nigeria and China. Also catering to history, but of a more generic kind, is the Riverside Museum in nearby Partick, along the Clyde just to the West of the city – a couple of miles from the centre but easily walkable down the riverside footpath that also takes you past a couple of modernist structures like the Scottish Hydro arena that looks like an advanced UFO, and the “Scottish Event Campus” venue that looks a bit like an armadillo. * shrug. The path itself goes all the way to Loch Lomond; a simple, if long, way to easily get out of the city. The ‘Armadillo’. Oddly, this isn’t even the weirdest building on site, just the easiest to photograph! The Riverside Museum itself is fairly badly-named. It’s actually a transport/travel museum built over two levels (although most of the display is on the ground floor). It’s a heaven for transport enthusiasts of all kinds, with railway engines, authentic Glasgow trams, a wall full of cars through the ages, another wall full of motorbikes through time (including the two used by Charley Boorman and Ewan McGregor in ‘The Long Way Down’), buses, a couple of displays relating to ships, and all manner of other interesting items. The sides of the museum have rooms depicting typical shops and sites through the ages, each with displays and information about what these shops and objects meant to people at the time (as an aside it’s slightly concerning to see things from my own childhood displayed in a museum like this!). 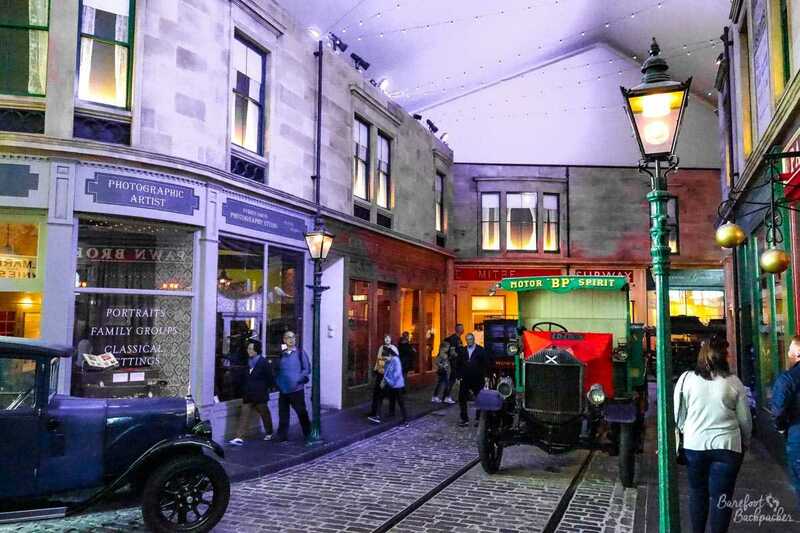 One section is even set out like an authentic 1930s Glasgow street, with lighting, trams, and typical shops you can go in and explore. Inside the Riverside Museum. This is a replica of an old city street, complete with information about the period shops that lined the road. 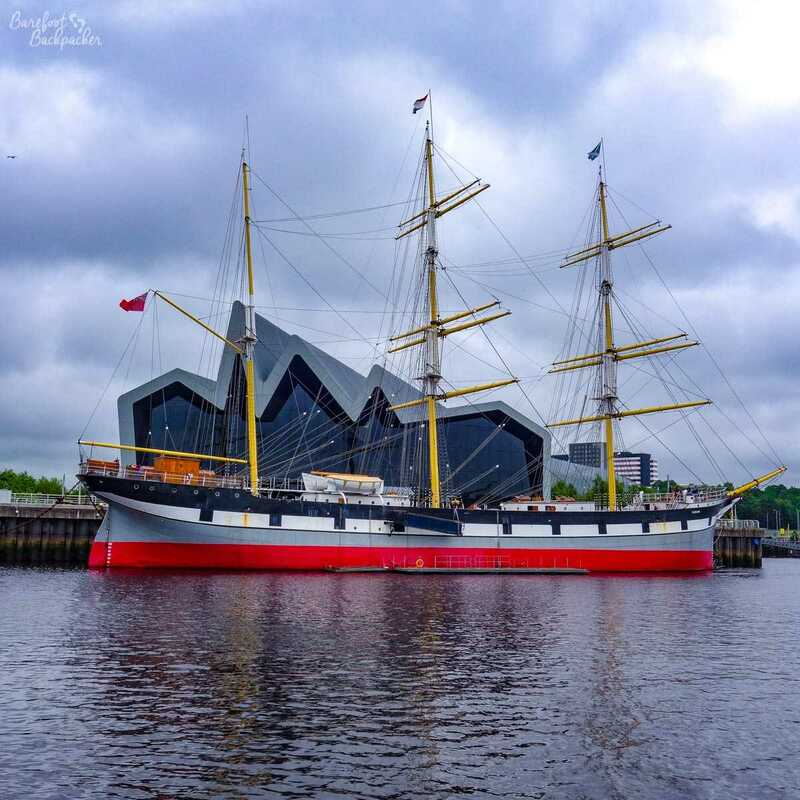 Outside the Riverside Museum, on the Clyde itself, stands what is known as the ‘Tall Ship’. Originally a Spanish trading vessel captured by the British, it’s now a fully-accessible naval museum showing what life was like on board a typical merchant ship in the 18th & 19th Centuries. As Glasgow made its fortune on sea trade, it seems a fitting and important place to visit. You can explore the whole of the ship – from the top deck (with rigging, brooms to wash the deck with, and a bell that every. single. child. decided to ring as they passed), all the way into the heart of the vessel with the engine and the cargo hold. Incredibly child-friendly as well as informative for adults, it documents not only the history of this ship itself, but also more general aspects of life on-board, including cooking and sleeping, and piracy. The ‘Tall Ship’ merchant vessel on the Clyde. Pic taken from the Govan side of the river. On the East side of the city centre is another historical museum, looking at Glasgow specifically. The People’s Palace was built in the 1850s specifically to provide a cultural centre for the residents of the East End to rest and learn – it lies in Glasgow Green; a huge parkland area that’s used as the site for the Glasgow Fair and many other open-air events, and is also the location of the Doulton Fountain – a throwback to the days when Glasgow was arguably The Second City Of The Empire, it’s a hugely impressive and overbearing fountain; a statue of Queen Victoria surrounded by four statues that represent different corners of the then Empire. Impressive, and yet so dated. 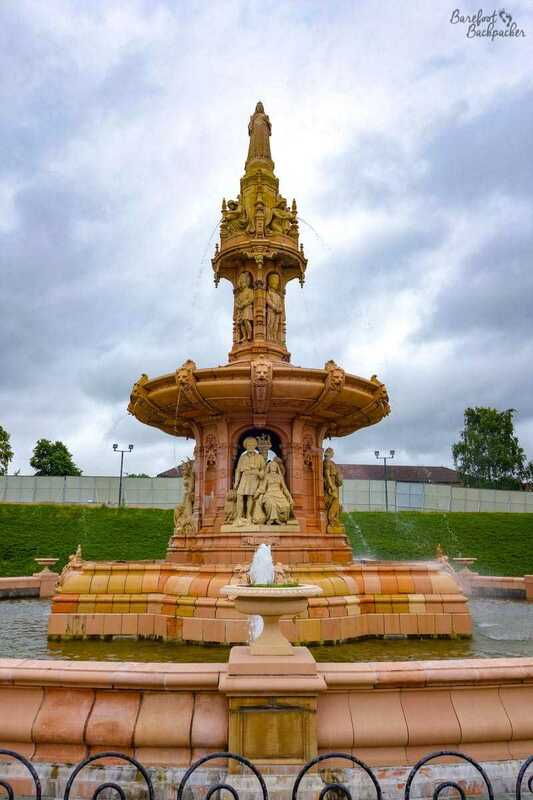 The Doulton Fountain. Very definitely ‘of its time’; so much colonial! The museum itself gives a generic background to Glasgow history and culture, from childhood games to elderly care, from tenement living to homelessness, food, drink, entertainment (the famous Glasgow Barrowlands nightclub and concert venue is only a few hundred meters from the museum), plus a section on the local dialect and humour – including costumes from Billy Connolly and Rab C Nesbitt, both iconic Glaswegian icons. Behind the museum are the Winter Gardens – an enclosed pavilion with all manner of plants and flowers, plus somewhere to have a nice sit down and an overpriced coffee. Still, it’s quite pleasant to have a wander along the grilled floorboards and stand amongst the tall greenery. I mean, it’s not my scene (I prefer real forests) but it was free and a calming way to spend a few moments. If all of this sounds a bit ‘stale’, Glasgow has one more trick up its sleeve. On the way to Partick, between the Riverside Museum and the Hydro Arena, lies SWG3. An old warehouse and car park next to a railway viaduct, sandwiched between a student area and a very industrial zone, has been converted into an indoor indie market and outdoor street art exhibition. 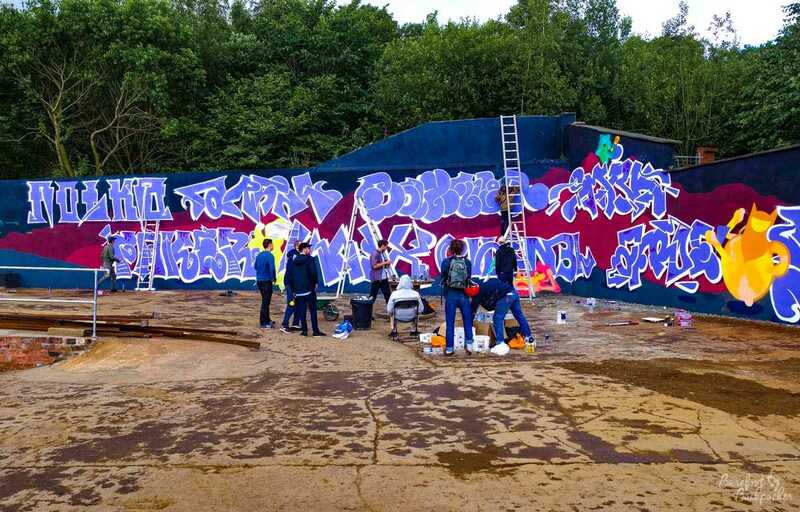 Local graffiti artists can be seen painting on the maze-like walls in the open air, whilst the old warehouse has been converted into a monthly themed market and real ale arena – there’s a DJ in residence too and the back room looks like it works as a nightclub-type venue. It’s still very new so they’re still fixing up the place, but it feels like it will be a good addition to the Glasgow indie scene. Part of the outdoor street-art maze at SWG3. A little more structured is the Modern Art Museum in the centre of the city, near the City Chambers. It covers several floors, although the floors themselves aren’t terribly large, and, like most ‘modern’ art museums, its exhibits are quite hit-and-miss. The most iconic, however, is on the street outside. 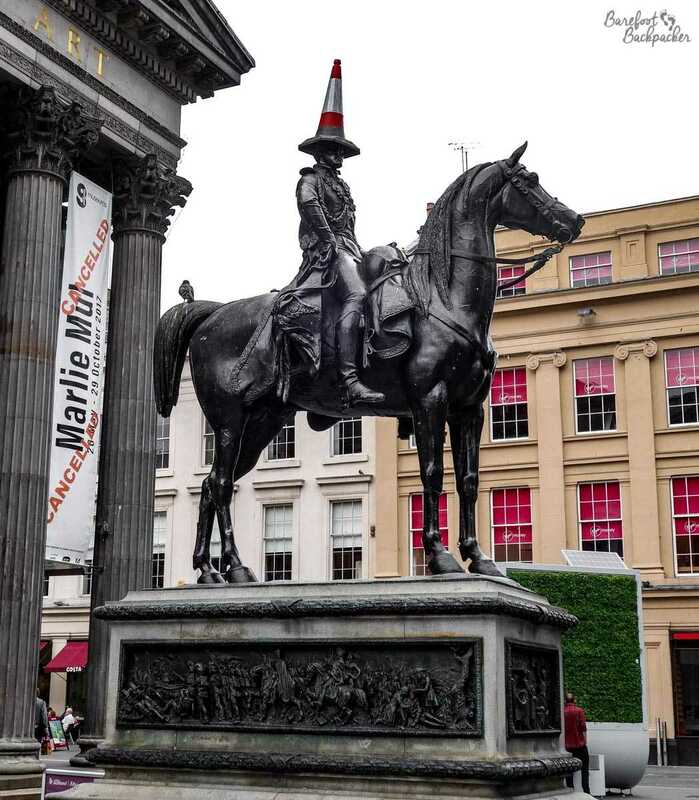 The statue of the Duke of Wellington is notable for having a traffic cone on his head. Some years ago, a group of drunk students thought it would be a laugh to climb the statue and give him a cone as a hat. Unsurprisingly, the police removed it the following morning. However, the next night, the cone reappeared. This continued for many years (! ), even through a period where the statue itself was fenced off – eventually the police gave up and just left the cone there. 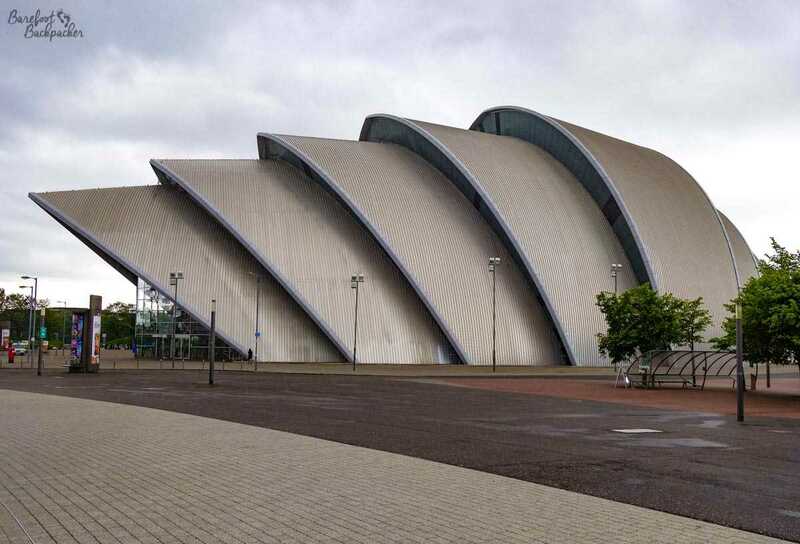 It’s now a famous Glasgow icon; amongst younger people it’s probably the biggest symbol of the city. The Duke of Wellington Statue, complete with traffic cone. When all that’s got you weary, there’s any number of places to eat and drink in the city too. The Hillhead district, in the West just beyond Glasgow University, is very much a student hangout; streets like Ashton Lane, Cresswell Lane, and Downside Lane are lined with small independent shops and cafés, and on the main street (Byers Road) is Crolla’s, which sells the best ice cream I’ve had, plus a mighty fine milkshake. Typical small street in the district of Hillhead. “Eclectic”. Over by Trongate is the “Trans Europe Café” – a small but quirky café where the sandwiches are named after European Cities and the décor is very much 1970s European transport (even the logo is a European train). They were not playing Kraftwerk through the speakers on my visit but no doubt it’s an important part of their playlist. Glasgow is, of course, famous for allegedly bringing to the world two notable foodstuffs. Over in the West, about a 20 min walk from the centre, lies the Shish Mahal Indian restaurant. It was here, the story goes, that a businessman in the 1970s walked in, ordered a portion of tandoori chicken, then complained it was too dry and needed a sauce. As a result, Chicken Tikka Masala was born and has since become the most archetypal British takeaway dish. I’ll concede I prefer my curries much spicier, but it was pretty good and their naan bread is to die for – huge and tasty. The other is the stereotype that ‘if it’s edible, it’s possible to deep-fry it’. While deep-fried pizza and doner kebab remain mythical to my experience, I was able to sample the ‘king rib supper’ – despite it’s name, it’s a minced pork patty covered in flour/batter and deep-fried; the ‘supper’ part meaning it’s served with chips – along with that very “Scottish” of foodstuffs, the deep-fried Mars bar. Oh how to describe this – it’s the best thing you will ever eat … for the first half. So sweet, so wrong, the first few bites you will revel in its opulence and forbidden nature. Then you get halfway and you realise it’s just far too sweet and sickly, and you can feel your arteries harden with every swallow. Deep fried Mars bar. Small, but deadly. Still, you could wash it down with a whisky. Just on the far side of the motorway is the Bon Accord pub, which sells over 400 whiskies from across Scotland, with knowledgeable staff who are more than happy to advise and direct you to something that will satisfy your tastes. That said, my remit didn’t quite extend to the one that was £500 for 35ml … in any case I’m a beer man (but they do plenty of those as well!). 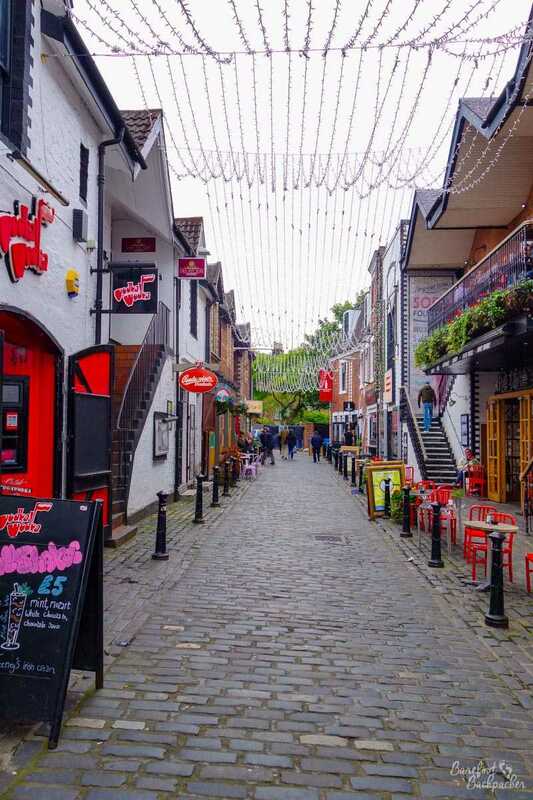 I left Glasgow feeling a little sad; there was so much more I could have explored given enough time – certainly you could spend three or four days thoroughly exploring the place, including venturing out further into the suburbs for quirky cafés and local culture, plus spending more time than I did wandering around the city. 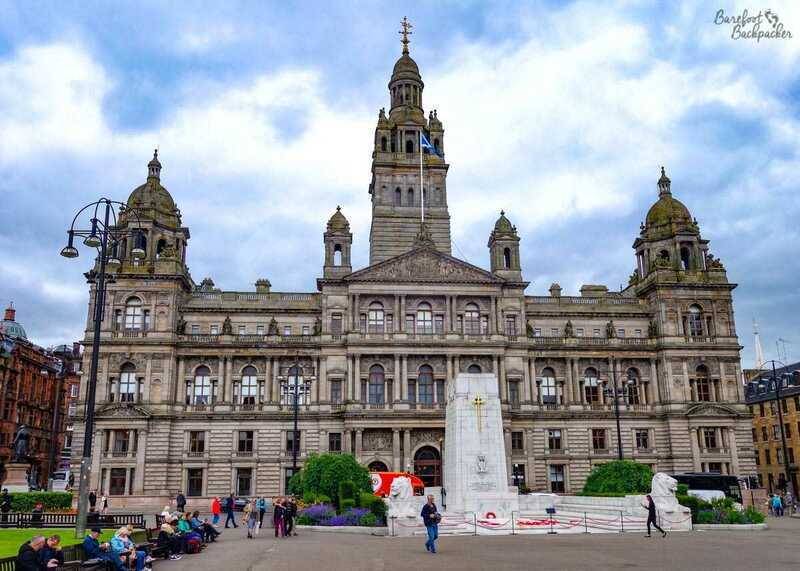 Its new tagline “People Make Glasgow” is certainly true – everyone I met was friendly and bent over backwards to give me information and assistance – but there’s so much more to the city than just its people; it’s got history, culture, and a certain vibe. 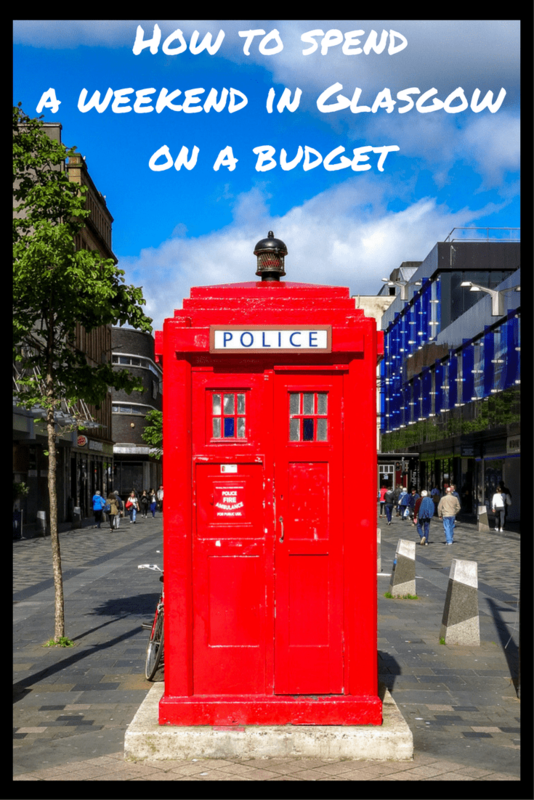 Disclaimer: This post was written at the request of CheapFlights.co.uk, who provided me a budget for booking flights and hotel on their website, and whatever was left was spending money. I may have overspent slightly, but that whisky was just so damned good! Authorities visited: Renfrewshire & Glasgow City, 30 June – 2 July 2017. My family live on Islay now, so Glasgow is the closest city. I really like it too. I don’t think the bad rep really applies anymore. Thanks for searching out so many places of interest. It’s definitely improved over the decades since the 1980s; very much more a ‘place to visit’ rather than a ‘place to avoid’. It was great fun exploring, it’s a good city!